This week, the Rafu Shimpo celebrated the 109th anniversary of its first issue. While the precise date of the first issue is not completely clear, the publication began in Los Angeles as a single-page mimeograph, produced by USC students Rippo Iijima, Masaharu Yamaguchi, and Seijiro Shibuya, in 1903. The paper’s name was composed of Rafu – a mix of an old Chinese word for Los Angeles and –fu for prefecture – and Shimpo, daily news. H. T. Komai became publisher in 1922, and the Rafu has been in his family’s care ever since, under his son, Akira, and currently his grandson, Michael. 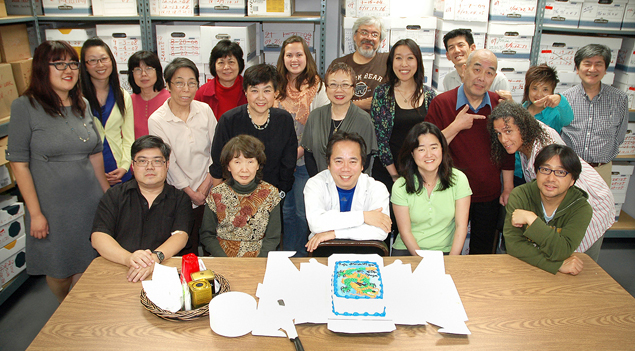 As one of the nation’s premier community newspapers, the Rafu Shimpo has thrived in good times and persevered though the bad, including economic depression, war against Japan, being shut down during the internment of Japanese Americans, the upheaval that followed Sept. 11, 2001, and the challenges presently facing all news outlets in a digital age. Publishing essentially daily – online and in print – the Rafu staff continues to strive to inform, educate and represent – the mission begun in the early 20th century. Congratulations! My mom has been a subscriber to Rafu Shimpo for over 40 years!